A2600 H.E.R.O. (USA) in 09:51.01 by StarvinStruthers. H.E.R.O. 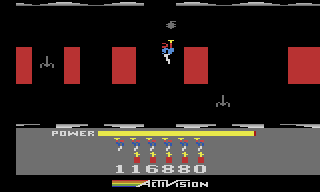 is a rare fast-paced platformer for the Atari 2600. You control a man with a gyropack who must traverse caves, avoid dangerous enemies, and use a few sticks of dynamite to blast open paths in order to rescue trapped miners. StarvinStruthers improves upon the previous publication by 4.77 seconds, due to the use of a new glitch called the "Door Skip".